Amber Palmer, Administrative Assistant for CISL and CISL newsletter editor extraordinaire, began her new position at OSPI as Superintendent Reykdal’s Executive Assistant on July 23, 2018. Amber has been a valuable team member and we will miss her. We are so glad she will remain our colleague at OSPI. The Curry School of Education at the University of Virginia and its Jefferson Education Accelerator are creating the first ever comprehensive catalog of education researchers in the country. By centralizing information about academic researchers in an easily navigable and freely available database, NERD will enable school leaders and education-focused innovators and investors seeking expert perspective and technical expertise to find researchers and involve them in their systems and processes. The goal of NERD is to facilitate engagement between unlikely collaborators in the education community in order to elevate merit over marketing and increase the use of evidence in decision making. Are you struggling to determine how to select and intensify interventions? Join Meagan Walsh, M.Ed., and Lynn Fuchs, Ph.D., July 25th from 3-4:15 p.m. for a webinar The Taxonomy of Intervention Intensity: A Case Example for Building Intervention Intensity in Reading. In this webinar they will demonstrate how the Taxonomy of Intervention Intensity can support educators in systematically selecting and modifying intensive literacy interventions based on student need. After providing a brief overview of the dimensions for evaluating and building intervention intensity, they will share a detailed case study illustrating how a teacher used the taxonomy to provide data-based individualized instruction in reading comprehension. Unable to join on the 25th? An archived version of the webinar will be posted on the NCII website following the live event. Did you miss the first webinar in the Taxonomy series focused on math? You can view an archived version here. 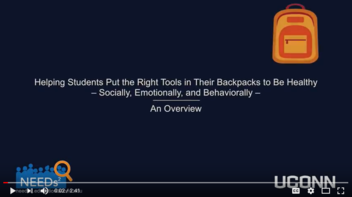 In this webinar, David Lewis, Director/Program Manager of Behavioral Health Services at Seattle Public Schools, introduces trauma-responsive practices to support a student’s ability to be successful, and answers your questions. Moderated by League of Education Voters State Field Director Kelly Munn.